An explosion of health benefits occurs when apples, carrots and celery are combined. This is due to the immune system being heightened by an army of antioxidants that ignite stronger disease-fighting capabilities and cellular protection of body systems. 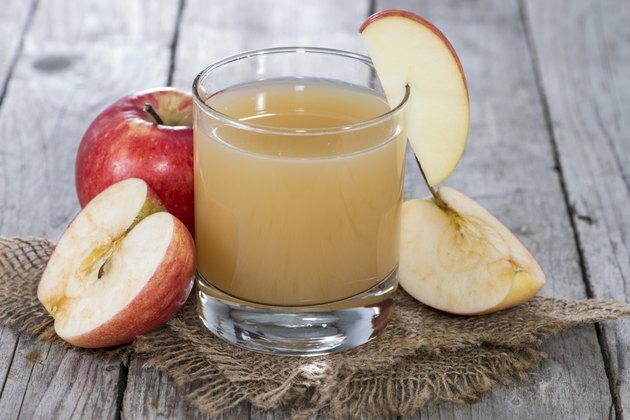 To garner the collective rewards of apple, carrot and celery, remove the seeds of the apple and chop the fruit and vegetables before blending with 8 ounces of your favorite water. The resulting juice will be an earthy sweetness that’s attuned to your health as much as you are. Coronary heart disease, stroke and cancer have all been associated with deficiencies of vitamin C found in apples, according to the Linus Pauling Institute. This is due to the ability of vitamin C to protect proteins, lipids and carbohydrates from the damaging effects of environmental toxins and pollutants. The vitamin C found in apples ultimately protects genetic information of DNA and RNA, the transportation system of genetic material in cells. The high volume of antioxidants in vitamin C gives momentum to the regeneration of disease-fighting capabilities of other antioxidants, including vitamin E.
Apple, carrot and celery juice can contribute to the overall health of your eyes, skin and body tissues due to an abundance of vitamin A. Through vitamin A, the eyes reach their optimal capacity for vision and are able to adapt to low lighting via retinol, the main component in retinal pigmentation. According to the National Institutes of Health, the antioxidant beta-carotene found in vitamin A protects against degenerative diseases by sheltering the body from cellular damage. The combined efforts of celery and carrots offer a magnified approach to bone health. The “Natural Medicine Journal” says that insufficient amounts of vitamin K have been shown to increase the risk of hip fractures in elderly men and women. Similar research conducted by the Nurses’ Health Study and published in the “American Journal of Clinical Nutrition” found that women aged 38 to 63 could reduce their risk of hip fractures by 45 percent through increased dietary intake of vitamin K.